Twenty years ago today World Championship Wrestling produced one of the greatest pay-per-view events in company history with Fall Brawl ’96: WarGames. Featuring a card full of good to great wrestling and a main event for the ages, Fall Brawl ’96 remains a timeless WCW PPV event that is every bit as good today as the night it took place. To mark the occasion Throwback Thursday on WDN reaches into the vault of the WWE Network (what else?) to take a look back at this classic WCW pay-per-view. Context is not an issue. All previous PPV, COTC’s, and NITRO’s are available on the Network. WCW Cruiserweight Championship: Rey Mysterio, Jr. The PPV opens with a vignette highlighting the war between the New World Order and WCW. Tony Schiavone, Bobby Heenan, and Dusty Rhodes discuss “WarGames” and Sting joining the nWo. Footage is shown from the previous NITRO of Sting supposedly joining the nWo, as well as footage from WCW Saturday Night (a series currently unavailable on the Network) of the nWo trashing Luger’s car. The three discuss who will be the fourth man for both teams as DDP’s music hits and the action begins. Diamond Dallas Page vs. Chavo Guerrero, Jr. This was the very beginning of DDP’s rise to superstar status in WCW. This match was part of the ongoing feud with the Guerrero’s, which went back to COTC XXXIII where Eddie Guerrero pinned DDP for the BattleBowl ring. A strong, well-paced opener, this match energized the crowd and, though it gets a bit sloppy near the end, got the show moving on the right foot. After a nip-and-tuck battle DDP reverses a Guerrero backslide into a Diamond Cutter for the pin at 13:08. After a WCW CompuServe promo we get an excellent WCW “Special Report” hosted by “Mean” Gene Okerlund called “The Attack”, detailing the entire New World Order/WCW saga. These two were a team known as Fire and Ice, who split up on the live edition of Main Event (currently unavailable on the Network) prior to Bash at the Beach ’96 in July. This is a stiff, often sloppy match that isn’t all that bad for what it is. It looks to be over when Scott Norton locks in a stranglehold gamma. Teddy Long gets up on the ring apron and is “snatched”, as Dusty says. Ice Train takes advantage and cinches in a deep full nelson for the tap out win at 7:16. The original match was to be Konnan defending against Psychosis, but Psychosis was apparently injured by Konnan and unable to wrestle, thus allowing Guerrera to make his WCW PPV debut here. Konnan’s “Mexican” title is actually the AAA America’s Heavyweight title. The match itself is more ECW than WCW with a very loose, open style that depends less on psychology and story than big spots, making it feel like it was meant more for the live crowd than those watching at home. In the end, after hitting Guerrera with just about every move he could, Konnan hits the Power Drop for the pin at 13:46 to retain. Jericho, with his “All the Days” entrance theme, makes his WCW PPV debut in this classic NJPW-inspired match. The match is really just a straight forward ‘rasslin’ match, devoid of any dramatic psychology and unnecessary flares one might expect from seasoned pros. That aside, this is a fun, stiff match that tells a solid athletic story. 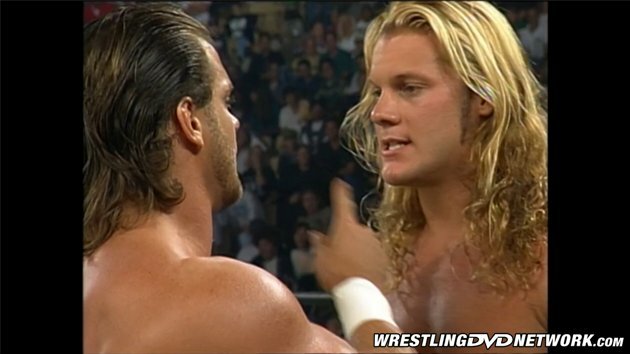 Jericho looked to have the match sewn up until Benoit crotches Jericho on the top turnbuckle, hitting a super back suplex for the pin at 14:39. Super Calo vs. Rey Mysterio, Jr.
As with most of WCW’s PPV Cruiserweight title matches at the time, there is virtually no story going in. Super Calo had just debuted on WCW TV on the last edition of NITRO, defeating Pat Tanaka, and spent the Friday and Saturday before the event in Knoxville and Johnson City, Tennessee, respectively, working Mysterio. The crowd is flat for this match save the big spots. The match is almost all Super Calo with Rey getting a bit of (incredible) offense in here and there. Calo misses a dropkick and lands on the back of his neck before Rey then hits a stunning double top rope springboard hurricanrana for the pin at 15:48. This one is an old school tag team match with old school tag team psychology. These two teams had been at each others throats for weeks prior to this match, and while the match isn’t fought under street fight rules the action is nonetheless fast and loose, with Col. Parker and Sherri playing as big a role in the match as either team. Near the end, Sags drops Booker T with the pump handle slam and Knobs hits the big splash from the second rope. Parker distracts the referee and gets into it with Sags, allowing Sherri to sneak into to the ring and brain Knobs with Parker’s cane. Booker T rolls over, puts an arm over Knobs, and gets the win at 15:31 to retain. 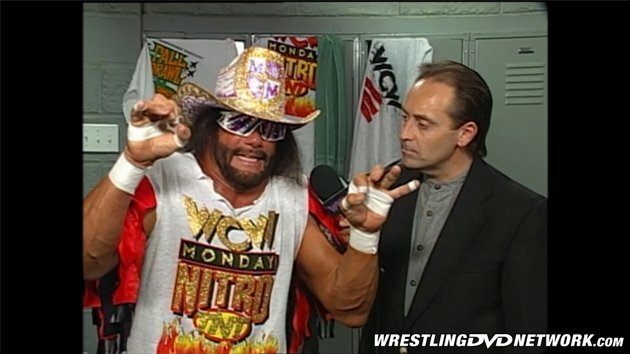 Next is an absolute classic Randy Savage promo with Mike Tenay about Hulk Hogan and The Giant. This one is all about Halloween Havoc ’96 where Savage and Hogan were set to face-off for the WCW World title. Though Giant and Savage had been at war since Giant joined the New World Order (1:17:00) and attacked Savage on the September 2nd edition of NITRO, Giant’s main focus here was softening up Savage for Hogan. This match is all Giant for the most part until Savage is able to get Giant off his feet and body slam him. Savage hits the diving elbow from the top and is primed for a win when Hogan comes out and lures Savage down the aisle where Hall and Nash beat Savage down. Dirty referee Nick Patrick doesn’t see anything as Hogan, Hall, and Nash put Savage back in the ring for Giant to gain the 1-2-3 at 7:47. 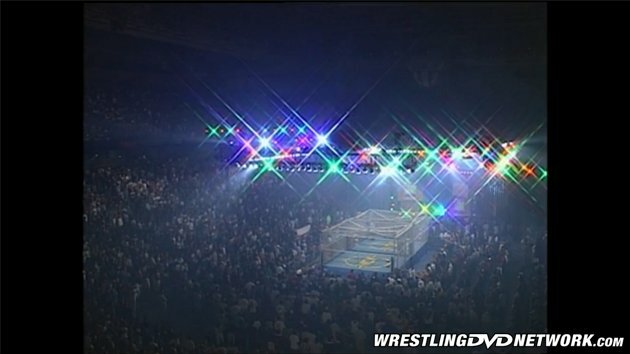 After a Halloween Havoc ’96 promo the pyro goes off and the double-cage comes down. In the back, Mike Tenay questions Ric Flair and “Team WCW” about who will replace Sting. Sting comes in and proclaims his innocence but no one believes him. Arn Anderson and Scott Hall start it off, and right away it’s a fight. Anderson takes the upper hand early in the first period until Kevin Nash joins the match, and it’s all “Team nWo” for the second period. Luger hits the ring ten seconds early and takes the fight to the nWo in the third period. Hogan is next, giving the nWo a 3-on-2 advantage for the fourth period, and the nWo takes full control until Ric Flair evens up the sides and takes the fight to Hollywood Hogan and the nWo for the fifth period. “nWo Sting” debuts next, and the crowd is not fooled. “nWo Sting” wipes out “Team WCW” in the sixth period with Sting’s own moves. Suddenly the real Sting hits the ring and single-handedly takes out the nWo as “The Match Beyond” begins. With the nWo on the ropes Sting tells Lex Luger off and walks out, leaving “Team WCW” for dead. The nWo take advantage and begin to destroy Lex Luger. Singled out in ring two, “nWo Sting” puts Luger in the Scorpion Death Lock as Hollywood Hogan cinches in a front chancery for the submission win at 18:06, bringing an end to a classic “WarGames”. After the match, Luger crawls up the aisle, screaming for Sting. The nWo put the boots to Luger until Flair and Anderson make the save. Savage runs out and drags Hogan to the ring where Savage is ambushed by The Giant. Elizabeth comes to Randy’s aide, covering Savage’s body with her own, only to be tagged “nWo”. Hogan cuts a promo on Savage and Elizabeth being together “till death do us part”, and vows to make it happen before spitting on Elizabeth. The Giant tags the ring and Savage’s back “nWo” before hitting Savage with a final chokeslam. The nWo take over the broadcast position. Hogan and Giant cut a promo while DiBiase says they want every one of their demands met. We see Savage being helped to the back, Elizabeth by his side, as the credits roll. WCW was on a roll at this point in 1996. Not only had they pulled even with the WWF in the “Monday Night Wars”, but they were producing arguably the best run of pay-per-views in company history. 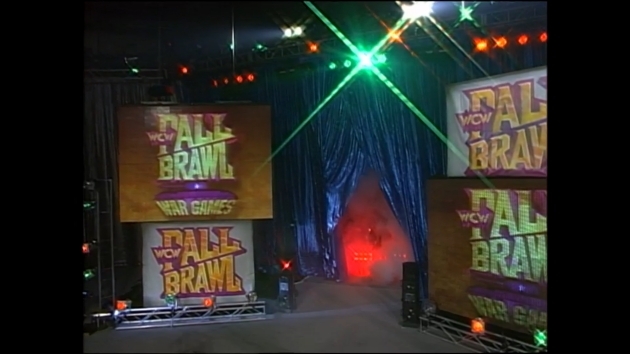 While the event isn’t perfect, Fall Brawl ’96 may very well be the best of the eight Fall Brawl events, featuring a handful of solid to great matches (with really only one dud in Ice Train/Scott Norton), and one of the best “WarGames” ever, even with it’s glaring flaws. If you haven’t seen Fall Brawl ’96, and are already signed up for the WWE Network, what are you waiting for? Check out the event and let us know what you think below. That’s all for this week’s TBT on WDN – thanks for reading! Watch WCW PPVs, the upcoming WWE Clash of Champions PPV and 6,000 more hours of content only on WWE Network. Your first month is FREE! Click here to subscribe to WWE Network. The only thing that really sticks out in my mind when Fall Brawl 96 is brought up anywhere is Sting coming in, hitting his spots, then walking out which further foreshadowed his transition into dark silent Sting. I remember Sting staring at Jeff Jarrett from the stands as Tenay interviewed JJ who spoke of how Sting dropped the ball at Fall Brawl and hasn’t been around since. Unknown to him, Sting was listening. What I hated is how the next week, the commentators spoke of Sting like a criminal and were acting clueless as to why Sting hit the Deathdrop on JJ. DUH! It was because of JJ’s comments towards him that he was listening in on!